Charleston USAF Museum, a walk around. At first it was assigned the manufacturer's serial no. 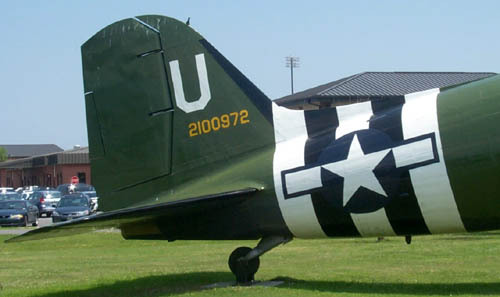 15171, due to duplication this was revised to 26616; it was delivered from the Douglas factories to the USAAF with tailnumber 43-49355, in Dec44. Many details of its history seem to be lost, but it was designated a VIP transport (VC-47D) by Sep54 for the USAF. With the 0 (for obsolete...) added to its tailnumber, it continued its servicelife bravely with the 437th MAW (Military Airlift Command) & 315th MAW. This "Skytrain" was preserved at Charleston,SC as 2100972 (short for 42-100972) "Chattanooga Choo Choo" by (since?) 1982. 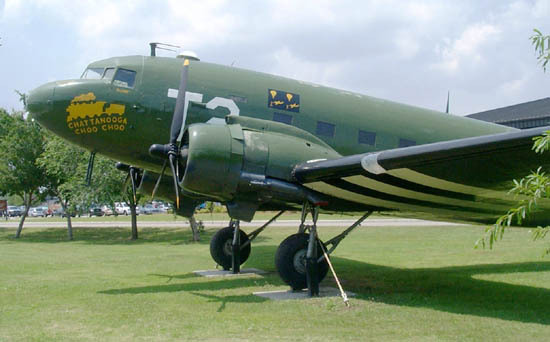 The C-47B Skytrain photos were taken on 19May05. 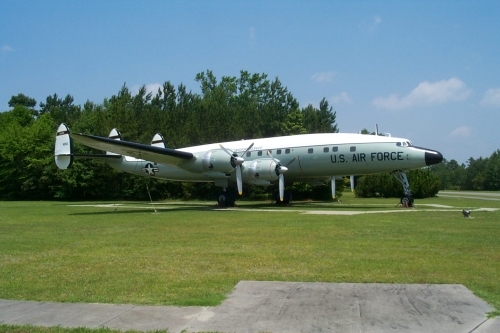 "The C-47 Skytrain on display near the base flag pole was given to Charleston AFB in August 1982. 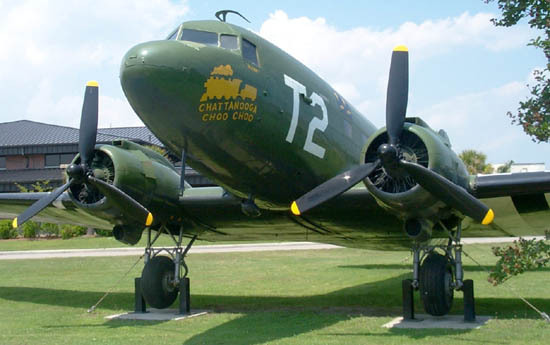 During restoration it was painted to replicate “The Chattanooga Choo Choo” originally assigned to the 83rd Troop Carrier Squadron, another World War II 437th Troop Carrier Group flying squadron. The real aircraft was listed as missing in Burma on October 21, 1944. 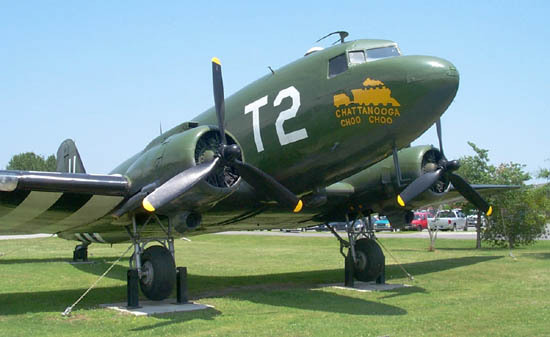 The static display C-47 was acquired in 1982 from the Confederate Air Force and is marked with the group’s D-Day paint scheme. Although restoration efforts were extraordinary, the aircraft on display is not an exact replica." 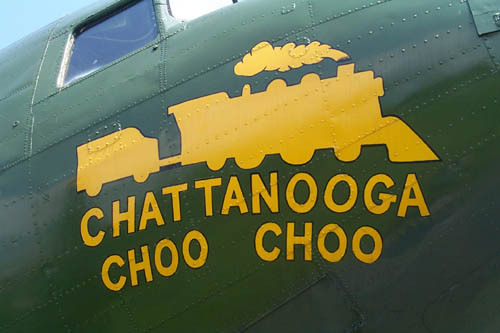 There was a song written in 1941 that was very popular during World War 2 called "Chattanooga Choo-Choo". 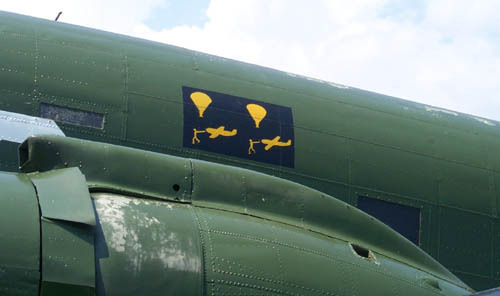 Years of display outside are leaving their marks on the aircraft. The following photos were taken by Walt on May 23rd, 2005. 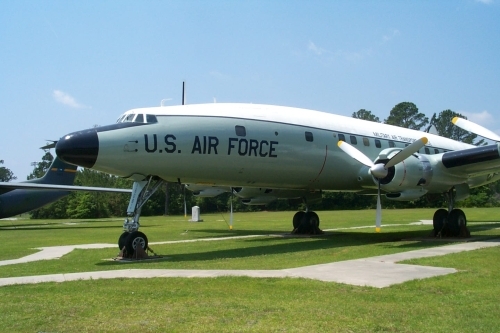 Lockheed C-121C Super Constellation, displayed with USAF serial 54-0153, however its original serial was 54-0180. 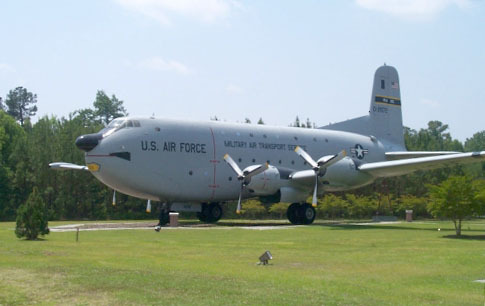 Construction number of this C-121C is 4199. 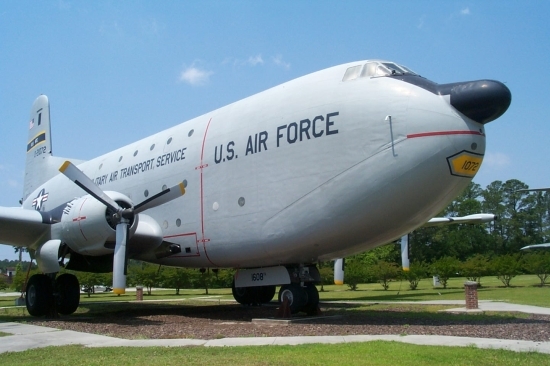 This Douglas C-124C Globemaster II, serial 52-1072, is a true "Giant of the Skies"! 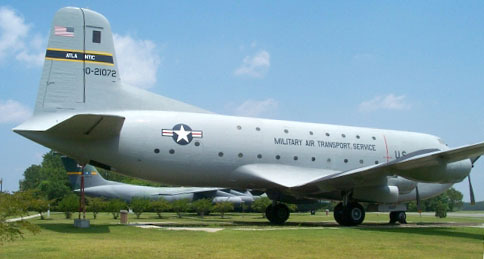 Construction number of this C-124C is 43981. "The C-124 was opened up last year after remaining unopened for a number of years, and a 1972 Ford staff car was found inside! It was removed and sent to the USAF Air Mobility Command museum at Dover AFB for restoration and display." It also provides links for more info on these aircraft. "Five miles northwest of Charleston on Interstate 26. Near the north gate of the AFB the following aircraft are on static display: "
Its 4 Pratt & Whitney R-4360-63A engines rise high above the ground; with a cruising speed of 230mph/370kmh it would have a range of slightly over 4.000 miles (almost 6.500 kms).